TS LAWCET 2015 Helpline Centers :The qualified and eligible candidates of TS LAWCET/TS PGLCET-2015 Examinations are informed to attend certificate verification for Web counseling for admission into LL.B (3-years courses) and BBA LL.B / BA LL.B / B.Com LL.B (5-years integrated courses) & LL.M courses for the academic year 2015-16 as per the schedule given below at any one of the following Help Line centers. Hyderabad 1. JNTU Kukatpally, Hyderabad. 3. Govt. Institute of Printing Technology, Marredpally, Secunderabad. Warangal 4. Kakatiya University, Warangal. Processing Fee: Candidates have to pay a non-refundable processing fee of Rs.500/- (and Rs.250/- in case of SC/ST) at the time of certificate verification. LL.B. 3 Years LL.B. 3 Years LL.B. 3 Years LL.B. 5 Years LL.M. Telangana. Tentative fee payable now is subject to fulfilment of eligibility criteria, in case found not eligible the candidate shall pay the difference of fee. 4. 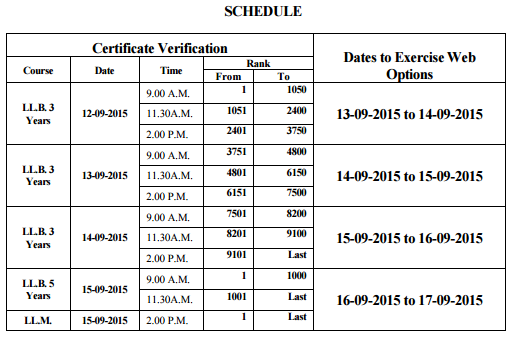 Special category candidates (NCC / SPORTS / CAP / Physically Handicapped) for all courses LL.B 3years, LL.B 5years and LL.M are directed to attend Certificate Verification only at Nizam College, Basheerbagh, Hyderabad from 14-09-2015 at 9: 00 AM.